In troubled times when economy is key everywhere, people worry about how much fuel costs and so on, some people worry about how much power could be handled by one of the smallest and lightest cars in production. Most of these people work for Hennessey Performance Engineering and what their most recent car has to offer is nothing other than uncompromised performance. On this basis they started with the Lotus Exige and added what Hennessey products have always had: a lot more power. To start with the new car has the same engine found in the ZR1 Corvette, a 6.2 liter LS9 V8 tweaked in house to produce 725 hp and 741lb-feet of torque. Sounds like a lot for the Exige, but Hennessey think it’s not so there are a couple of twin-turbo V8 options with power outputs of 1000 and 1200 hp. 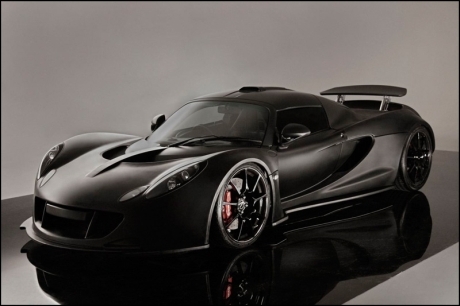 The Venom GT is expected to hit 60 in less than 2.5 seconds and the top speed is predicted to be 262 mph. If confirmed it would be the fastest production car in the world. These amazing figures aren’t the result of just the tremendous power of the engine, it’s sent out by a Ricardo six speed gearbox and the tires that put it down are some immense Michelin PS2s. Making sure all of these components work together is, as always in recent years, a computer that provides a programmable traction control system. Straight line performance is amazing but Hennessey has also worked on track aspects of the Venom GT as it only weighs 2400 lbs (that’s just over a tone), has a braking system that has Brembo written on it and features 6 piston calipers for the front, 4 pistons for the rear, teamed with 15 inch rotors made of carbon ceramics and it’s body has been reengineered aerodynamically using CFD after the body had been stretched. To aid stability at high speed the rear wing and the suspension are actively adjustable depending on speed and driving conditions. The price of this yet to be proven Veyron killer is 600.000 dollars for the “basic” version and production is limited to ten per year. As it turns out, there are already four people waiting to grab hold of their Hennessy Venom GT.